"MITOOL" make Electromagnetic Vibrating feeders are most efficient & economical to convey the bulk materials & in the simplest easiest means of controlling the flow rate.It is driven by electromagnetic drive. Mitool Make Vibrating feeders are most efficient & economical to convey the bulk materials & in the simplest easiest means of controlling the flow rate. The Vibrating feeders are extensively used in mines, chemicals, ceramic, Rubber, Pharmaceuticals, clay, Iron & steel Industries, collieries, Quarries of glass industries for handling of all type of materials capacities from 1 Ton to 400 Tones per hour. Vibrating Feeders are operated by giving pulsating D.C. supply. When this pulsating supply passed through starter creates a series of interrupted pulls on the Armature. 3000 pulse (Vibration) are occurring in one minute. The Vibrating feeder consists of vibrating trough fitted to the drive unit of considerable weights The electromagnet unit is mounted inside a heavy housing unit, The power unit which is mounted inside the housing houses the spring bars (Flats) which consist of a number of leaf springs clamped at the both ends of the power unit. A heavy fabricated centre piece carries the magnet armature at one end & vib feeder trough at other end. The centre clamp tightens at the middle of the spring bar system . 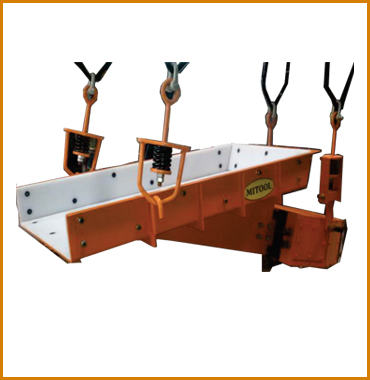 Stiffeners & gussets are provided to make the trough rigid. Our Feeders Protects the belt conveyors from damage by feeding the material on to the belt conveyors from storage hoppers, silos, surge hoppers & dumpers at the controlled rate. In magnetic feeders there are no wearing mechanical parts, such at gears, cams, belt, bearing, eccentrics weights or motors. Mitool Vibratory feeders are most economical equipments.